KANSAS CITY, Mo. 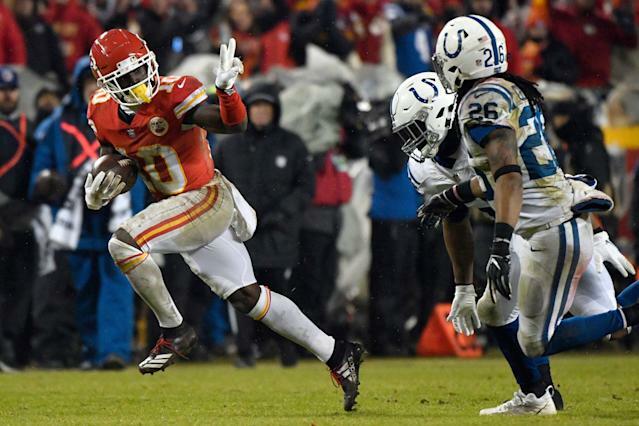 – Police are investigating an alleged battery incident involving Kansas City Chiefs receiver Tyreek Hill. According to a police report from the Overland Park Police Department that was filed on Thursday and obtained by The Kansas City Star, there was a battery incident that lists a juvenile as the alleged victim. Hill's fiancee, Crystal Espinal, is listed under "others involved." A source told the Star that the incident was against the couple's 3-year-old son, and Hill's fiancee had been in contact with the police. According to a police report obtained by KCTV5, officers were previously called to the same address to investigate a report of child abuse or neglect. Hill's name is listed on that report which was subsequently closed, but not the most recent one. Mike Deines, the communications director for the Kansas Department of Children and Families, told Yahoo Sports that a report was received and an investigation is ongoing. Hill and Espinal, who were engaged in September, have history. Hill, 25, fell to the fifth round of the 2016 NFL draft after he pleaded guilty to domestic battery in Stillwater, Oklahoma, in December 2014. Espinal was eight weeks pregnant with their son at the time of the violent incident in which Hill punched and choked Espinal. By pleading guilty, Hill avoided jail time and was given probation with a three-year deferred sentence. Hill was also ordered to complete a 52-week batterer’s intervention program and an anger management course. When he completed his probation in August 2018, the charges were dismissed. Hill blossomed into a star in Kansas City, first as a first-team All-Pro return man in 2016 and then as a first-team All-Pro receiver in 2018, when he caught 87 passes for 1,479 yards and 12 touchdowns. Hill has made the Pro Bowl all three years he has been in the NFL, and as he enters the last year of his contract in 2019, he and the Chiefs had begun discussing an extension that would make him one of the league’s highest-paid receivers. The league on Friday levied an eight-game suspension on Cleveland Browns running back and former Chief Kareem Hunt, who shoved and kicked a woman in an incident revealed on video in December. Shortly after the video went public via TMZ, the Chiefs released Hunt, who later signed with the Browns.